Our uncomfortable, unhealthy homes can be linked to the Building Code. Our Building Code is enshrined in statute and comprises a performance-based set of rules to achieve a minimum standard. The code has eight key areas that range from protection through to energy efficiency. Any new building, or one undergoing major renovations, is required to meet these standards. This ensures the building will be durable and stand the test of time. However, when compared to building standards around the globe, our code just isn’t up to scratch. Our newly built houses are cold, mouldy and unhealthy, while countries in the European Union are charging towards zero-energy homes. It’s easy to see where we’re lagging. It comes down to having too low a standard with two main housing factors – warmth and ventilation. You would expect a newly built house to be warmer and healthier than an older one, but this isn’t always the case. You can build a new home with no built-in heater or minimum temperature requirement. The code requires a minimum temperature of 16°C in rest homes and early childhood centres, but this doesn’t extend to other buildings. To maintain a healthy and comfortable environment, your household temperature needs to be at least 18°C. When you rent out a property, you have to provide a heater for the living room, but there’s no obligation to install something when you build a house. Building a new house provides you with the ideal time to think about whole-home heating systems. It’s also the perfect opportunity to consider passive elements, such as the size and layout of north-facing windows, which can provide free heat during the day. Our insulation requirements are also behind other countries’. Our houses are divided into three climate zones. 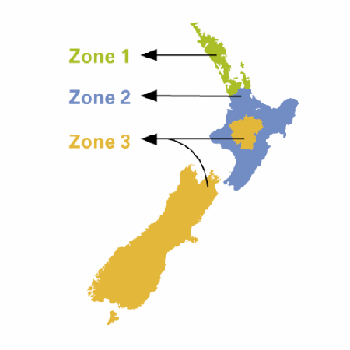 Zone 3 includes the Central Plateau as well as the entire South Island. Zones 1 and 2 have identical insulation requirements, while homes built in Zone 3 have slightly higher roof and wall insulation requirements. GUIDE TO THE TABLES The climate axes of the below graphs represent how warm the environment is and the amount of heating required to stay comfortable. Heating Degree Days (HDD) provide a number to indicate the coldness of a location. The larger the HDD, the colder the climate is at that location and the more heating will be required. HDD are calculated by summing up the differences between the average daily outdoor temperature and a base temperature (typically 18°C for inside buildings) for every day of the year the average daily temperature is below the base temperature. Hover over the data points to display the city, R-value and HDD. New Zealand cities are coloured blue. We rank better than a few of the sweltering Mediterranean countries, such as Greece and Italy, but for the most part we’re chasing the pack. It gets very cold in Sweden so you expect them to be leading the charge. That said, the American cities on our graph – Los Angeles, San Francisco and Dallas – show that houses in warm climates also benefit from higher ceiling insulation requirements. We’re only ahead of Athens in our underfloor insulation standards. You can even build a house with no floor insulation in New Zealand if the floor is concrete. Slab insulation has been around for a long time, but it hasn’t been made mandatory here, like it is in the UK. Germany has the highest insulation requirements for glazing, whereas ours is right down the bottom. The winters in Berlin are much harsher than ours but we’re still behind similar climates, such as Australia. Wall insulation requirements show we’re sitting near the warm Mediterranean countries, but the differences between the top and lowest spec aren’t as pronounced as in the others. This is because the focus should be on the ceiling, floors and glazing. Even so, we’re still rooted in the bottom half. While you’d expect colder countries such as Sweden and Denmark to have greater levels of insulation than temperate New Zealand, looking at the graphs overall shows we’re behind in all areas when compared to countries with similar climates. The overall trend shows minimum requirements should go up as the climate gets colder – ours are in a flat line. Having proper ventilation is essential to creating a healthy home. Removing moisture-laden air improves air quality, making the home healthier and easier to heat. Our older pre-1990s homes are full of gaps and are quite well ventilated whereas our new builds are relatively airtight. The problem is houses without adequate ventilation can’t get rid of the damp, stale air created through day-to-day living, which creates an environment where mould can thrive. The code requires that habitable spaces must have opening windows equal to 5% of the room’s total floor area. Throwing open the windows helps get the air moving in your home. Whole-home, automatic ventilation systems are also popular. The problem with specifying a total window area is you only get ventilation when windows are open. UK building regulations specify whole dwelling and specific room ventilation rates. This means a healthy environment can be maintained without having to remember to open windows and wait for a dry spell during winter. We might be able to snot the Wallabies in the Bledisloe every year, but evidence shows they go home to lick their wounds in better houses. We build our homes to last a long time, so every new one that’s built could have up to three generations passing through it. Each newly built house that that only just meets our meagre Building Code potentially leaves the new and successive owners living in uncomfortable, unhealthy conditions. A well-insulated home is more energy efficient and will be cheaper to heat to – and maintain at – a comfortable temperature. Changes to the code seem to happen at a glacial pace, but if the focus were put on heating, insulation and ventilation, we’d all benefit. Looking to other countries where they’re getting it right and adopting their methods is a good place to start. It would lead to long-term benefit for all of us: living in warmer, drier, healthier homes. A house that meets the Building Code is the worst home you can legally build. Rather than just meeting the minimum, you can design and build your new home to exceed the current low standards, often at a negligible price difference. There are loads of different schemes globally, along with a few that have set up shop in New Zealand. Homestar was developed by the New Zealand Green Building Council (NZGBC). It’s a not-for-profit that advocates for healthy, efficient and sustainable homes. Achieving the minimum Homestar level is cheap and might only add 1.5 percent to the cost of a regular build. That said, there are higher ratings to achieve. Your costs climb steadily if you’re looking at knocking over the top Homestar house. You’ll also need to factor in the cost of an assessment (about $200-1000 depending on the number of homes being built). The minimum insulation requirements for Homestar are above code and you’re guaranteed a warmer, more comfortable home. This scheme places a heavy influence on sustainability and energy efficiency as well as comfort so, along with your home being healthier, it should be cheaper to run. 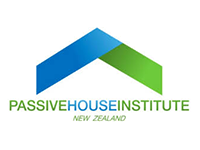 The principle of the Passive House standard is based around a very airtight house that provides even temperatures year round. The movement started in Germany and sets a building performance standard to achieve rather than individual specifications to tick off. So, while you probably won’t do away with heating and cooling costs entirely, your energy requirements – and what you’ll pay – will likely be very low. Unlike other schemes, a home’s performance is modelled before it’s even built. Location, shading and orientation are critical to achieving the standard, but it also considers insulation, ventilation, glazing and thermal mass. These factors work together to create an incredibly stable internal environment in your house, which means it won’t overheat or get too cold. Building a home above the Building Code is one thing, but what about the estimated 1.7 million homes already in New Zealand? The NZGBC has developed an online tool you can use to check your home provides a healthy environment. This 20-question assessment focuses on three key areas – Dry, Warmth and Safety and efficiency. If your property passes this self-assessment, you can call in a professional assessor to certify your home. Doing this shows your home is healthy and energy-efficient, which could help it command a higher price when it comes to renting or selling. A couple of Consumer staffers put HomeFit to the test in their own homes. Read about their experiences here.